James & Travis got deep on the exciting new Modern Masters 2017 release. With the latest spoilers revealed this morning, Modern Masters 2017 is officially the most exciting edition of the series, and one of the most exciting Magic sets of all time. 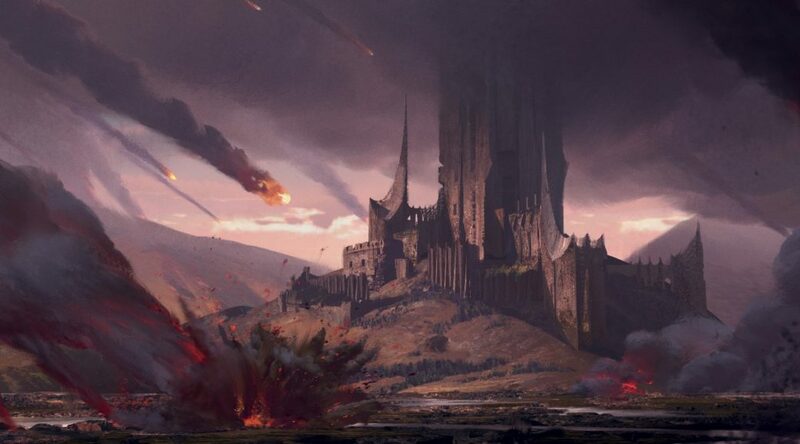 Wizards of the Coast is clearly looking for a home run here and there is a lot to digest in terms of how the set will impact investments in the Modern format for players and speculators. We now know 14 of the 15 mythic rares in Modern Masters 2017 [Update: Olivia Voldaren is the final mythic], and despite the inclusion of both Liliana of the Veil AND Tarmogoyf, with Snapcaster Mage and Cavern of Souls as a side dish, this offering is actually not that different than Modern Masters 2015. Here are some figures on the MM15 Mythics, courtesy of number crunching that Saffron Olive did over on MTGGoldFish at the time. 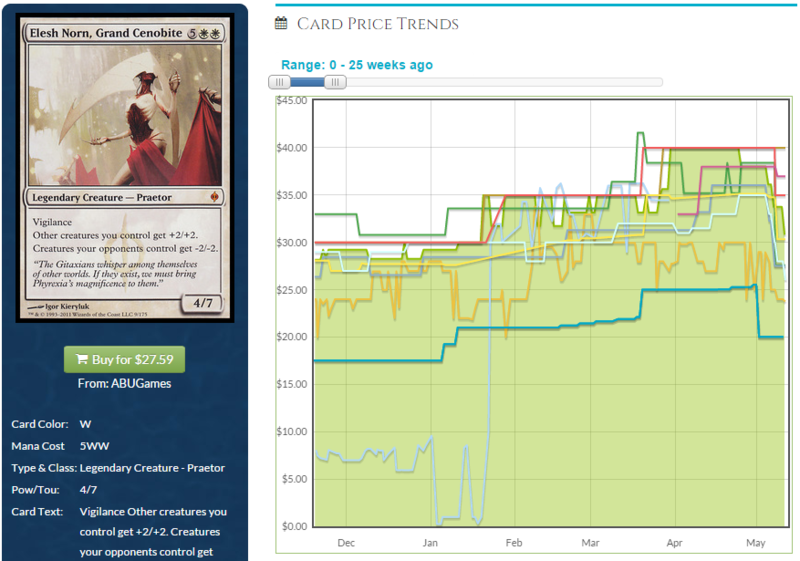 As you can see mythics were on track to contribute just under $90 in EV (Estimated Value) to MM15 at launch. Now take a look at the MM17 mythic offerings by comparison. 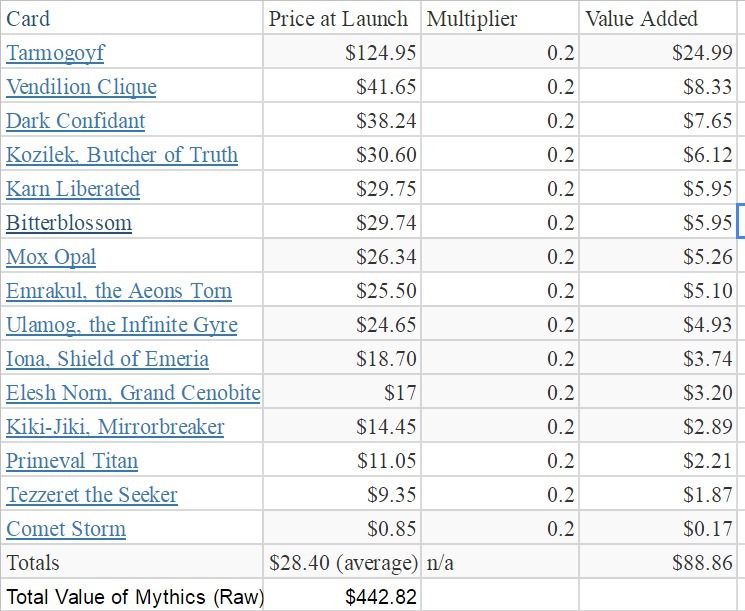 As you can see, the mythics may actually represent less value in this set than in MM15, largely because they are dazzling us with LoTV and Tarmogoyf, while offering up significantly less $25+ cards. That being said, the demand profile as persistent, multi-deck four-ofs for Tarmogoyf, Snapcaster Mage, and Cavern of Souls may help those cards hold value better and recover faster down the road. Prices as of noon Mar 2/17. Numbers are rough here, but rares are clearly a much bigger contributor to EV this time. If you squint, that’s a potentially whopping 50%+ increase in the EV being added by rares in this set, assuming a roughly equivalent value for the remaining rares, including likely bulk rares. I haven’t run the numbers on uncommons yet, but with key cards like Path to Exile, Inquisition of Kozilek, Serum Visions, Terminate and Might of Old Krosa, my guess is these numbers will come in equal to or above even Modern Masters (2013), and significantly above the uncommon poor MM15. If the set allocations were the same, these figures alone would make boxes a slam dunk, but beware, because there is more to this story. Early word from vendors was that Modern Masters 2017 featured an entirely different distribution pattern than the last two installments of the series. Previously, most vendors got some of their limited edition product from WoTC directly, and some of it via their distributors. This time around, distributors are controlling all of the inventory, making it much harder to get a handle on how much the print run has been increased (since you can’t simply measure WoTC case allocations). Many vendors reported that they had been offered “as much as they wanted” for MM17, which suggests that WoTC is fully aware of how juiced this set is and is looking to take advantage of the hype the kichen sink approach to set design will drive in order to achieve significantly greater sales. Solid information is still unfolding at this point but based on what I’ve heard so far I would estimate that the print run is at least 50-100% larger than previously, and possibly even beyond that. Massdrop.com sold over 1700 boxes in one drop the other day, and even more on a second one. Interestingly, after the fiasco of Eternal Masters “limited” product being made available to vendors a full six months after it was first released (in Dec 2016), many players and speculators were looking gun shy at the prospect of pre-ordering this set and I managed to pick up my boxes at $175 without issue before most of the reveals went down. As of this morning, boxes are hovering around $210-$220 a box and they hype train could easily drive them back into the MSRP range of $240 or even beyond depending on what the forthcoming final EV calculation articles confirm about the expected value of a pack or box. So should you be piling on to buy boxes with everyone else? I don’t think so. The Estimated Value on offer just so far, without the full set revealed, looks roughly equivalent for the mythics and significantly increased in the rare and uncommon slots. Paired with higher supply that suggests to me that nearly all of the cards included are going to take a large hit in the 20-50% range as we approach peak supply. Sure, a lot of cards recovered well from the last two Modern Masters sets, but they had less supply, and MM15 boxes appreciated much less than MM13 before them (partially due to lessened set value). If you got in on boxes under $190 when those were available in the last few weeks, you may get a chance to flip them for +$40/box at peak hype, and cracking them will be unlikely to cost you much if you need the cards. Boxes over $240 however are not somewhere I want to be with this set, as the EV today is very unlikely to resemble the EV in a few months. Couple that with the specter of another holiday season surprise re-release and even Japanese boxes around $300 look scary. Speculation with Modern Masters 2017 cards is not going to be easy. Once we know more about total supply, and we’ve seen inventory levels of key cards and mapped their likely peak supply pricing, we can start to probe for potential targets. Generally speaking you are going to want to look for desperation sales from folks who snapped up boxes looking to crack and flip, only to find that everyone else is doing the same thing and driving prices into the ground. Rares especially are going to be tough to keep afloat, and sales on Twitter and Facebook are likely to abound by early April. With a foil in every pack you should get a chance at some good deals on sparkly things for your cube or EDH deck. When picking targets you will want to pair your patience with data on which cards are actually being played in multiple archetypes, usually as a 4-of, and in multiple formats. Fetchlands, Snapcaster Mage, Goyf, Cavern of Souls, etc fit this profile. Given how much of this set is going to be bought and cracked in the next two months, you have already missed out on some key opportunities to sell off staples like Cavern of Souls and Liliana of the Veil. Zendikar Fetchlands: These are going to lose another 20-30% of their value as rares. There is too much going on in this set, supply is higher and dealers aren’t going to be motivated to prop up prices via aggressive buylisting. Same art too, so you can safely ditch and get back in with holograms a bit down the road if you have extras lying around. Tarmogoyf: I think Goyf could get as low as $60-70 this time if supply is high enough. Remember this is his third printing in 5 years, and supply wasn’t draining after the last time. 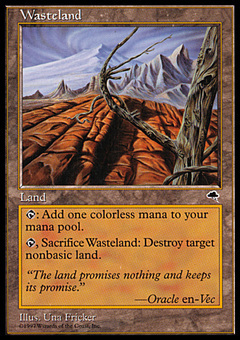 Damnation: This card’s price was propped up largely by the number of years it dodged a mainstream reprint. 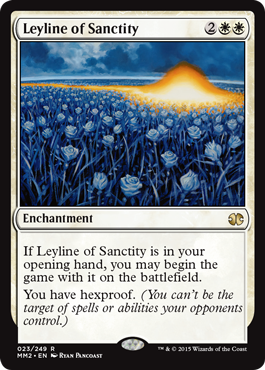 At $40-45, it might have held most of that value as a mythic, but as a rare, this thing will be far, far more common in six weeks. It’s really only run in Jund and Abzan in Modern, and usually then as a 1-of in the sideboard. Stony Silence is played more, and it’s $5. I think the price will get cut in half or worse, so if you can exit over $30, that should be a solid move. Cratehoof Behemoth: This will drop from $20 to $10. Get out. Linvala, Keeper of Silence: $10-15 card by the time this is over. It is worth noting that in removing Modern as a Pro Tour format, a reduction in Modern tournament support throughout the competitive ecosystem, and the continued LGS-only distribution of Modern Masters products, WoTC is signally strongly that Modern (and other Eternal formats) are Tier 2 priorities for them and are not the core drivers of revenue and user growth. Newly unlocked/underestimated cards, eg: Rite of Passage, Death’s Shadow, Amulet of Vigor, etc. Good luck out there…it’s getting tougher! I’m not going to talk about Modern Masters 2015. No, it’s not. And I said I don’t care. Maybe that’s a bit of an aggressive opening to this week’s article, but it’s honestly how I feel. I’m not diving in headfirst and buying mass copies of cards that have been reprinted, and I’m not squirreling away boxes of the set so as to gamble on their long-term desirability. 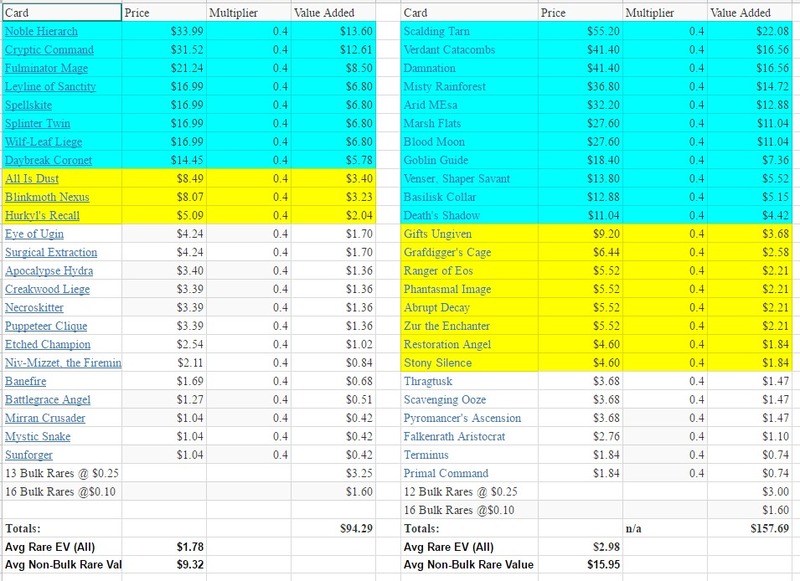 My methodology stays that same throughout this turbulent time in pricing, and that’s, “Buy stuff at or below buylist prices, and then sell it for TCGplayer-low through local individuals, Facebook groups, and on TCGplayer itself.” It’s really that simple, for the most part. If Timmy/Tammy cracks a Mox Opal but was hoping for an Emrakul, I’ll be happy to ship her $20 for it so that shecan grab two more lottery tickets. …I just talked about Modern Masters, didn’t I? Crap. Actually, this article is supposed to be one that will continue to be useful months and years after MM2015 stops causing a financial hurricane. 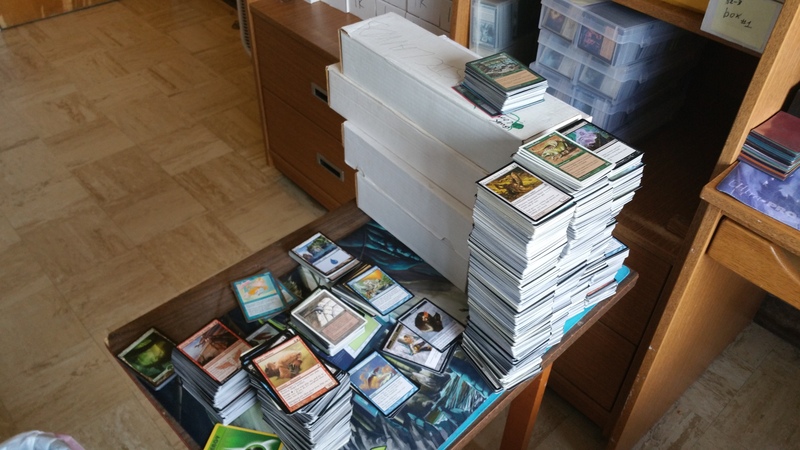 About a month ago, I purchased a pretty large lot of bulk commons and uncommons: approximately 150,000. Thanks to being able to negotiate with a past employer who owns a videogame store, I’m able to have access to a display case and physical retail location where I can buy and sell singles, collections, and bulk lots. 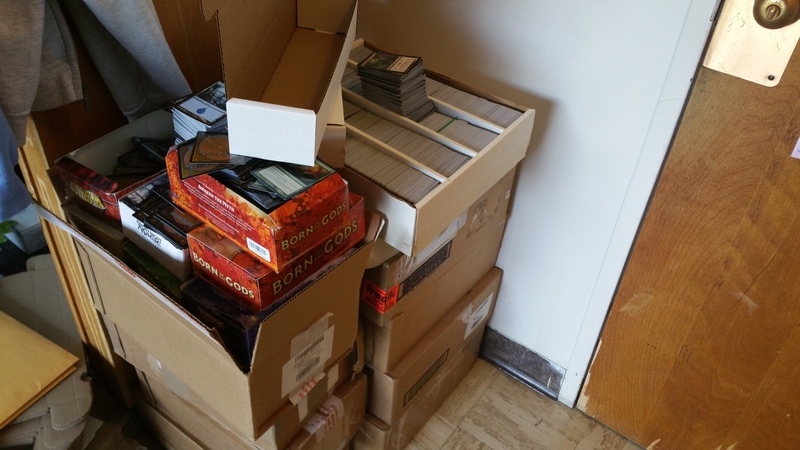 My most popular item is definitely a lot of 1,000 randomized commons and uncommons sold in a BCW storage box for $7. 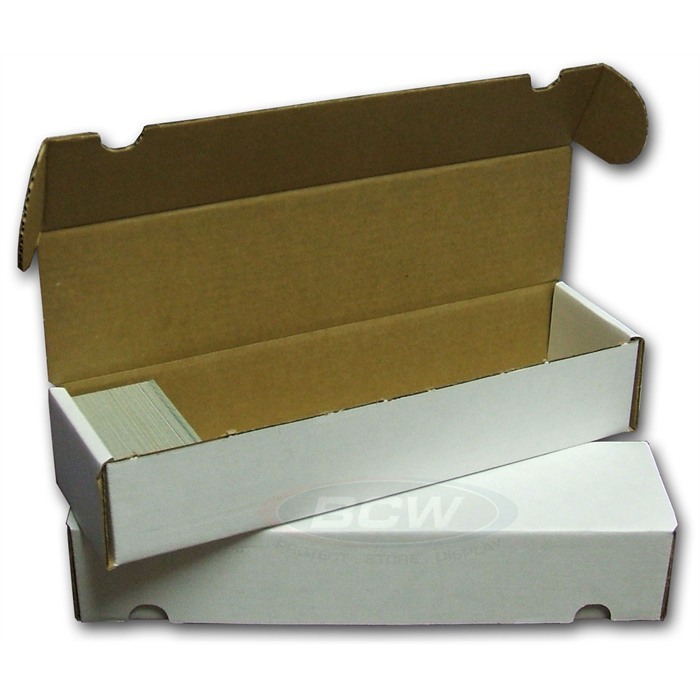 Quick aside: While I used to highly recommend ordering these boxes en masse from BCW itself, its shipping costs have changed since I last ordered from the site. “Super Saver Shipping”? Not exactly. If anyone reading this knows of an alternative method to acquire 1,000 count boxes for a cheaper price, please feel free to let me know so I can spread the word. I’d like to know for myself as well. One of the “Magic Rules of Magic Finance” that I tend to repeat a lot is that I will always pay $4 per thousand on unseen bulk commons and uncommons and never more. If I am already stocked up on tens of thousands of cards and am in no rush to acquire more, I’ll lower my buy price down to $3 per thousand. If the person I’m working with wants to trade for cards out of my binder, I’ll give $5 per thousand. Because a large majority of the cards in this lot were common and sorted by set and color, I ended up giving $500. It’s actually a lot more annoying for me to buy collections of commons and uncommons that are sorted methodically by color and/or set, because casual players don’t really want 14 copies of Pensive Minotaur all lined up next to each other. They want one or two of each minotaur from the set, and some supporting cards from other sets so they can build their own 78-card unsleeved minotaur deck akin to how Tony Stark built his first Iron Man suit. The more randomized, the better, and I let people know that before they sell to me. 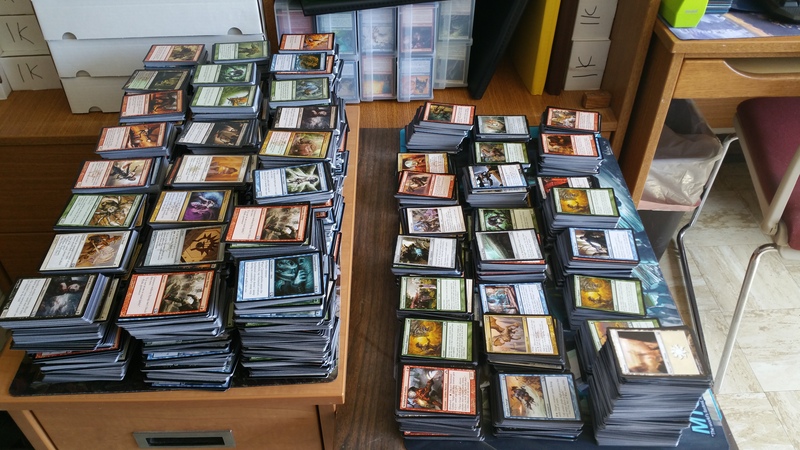 The most frustrating part of this buy was effectively randomizing the 100,000 cards from the recent blocks of Return to Ravnica and Theros and mixing them into the older stuff that was among the collection. Ideally, you want a wide mix of cards in every box so that Timmy/Tammy doesn’t feel like he should have just dropped his money at Wal-Mart on two packs of Return to Ravnica and gotten some rares with a chance at a planeswalker. 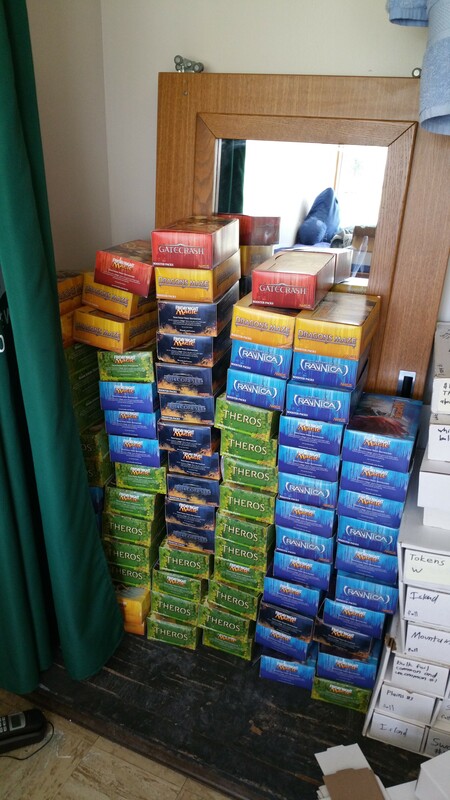 (Side note: announcing that you threw a planeswalker into one of these boxes may have the side effect of new players ravenously buying out every single box in hopes of being the winner of the Golden Ticket). 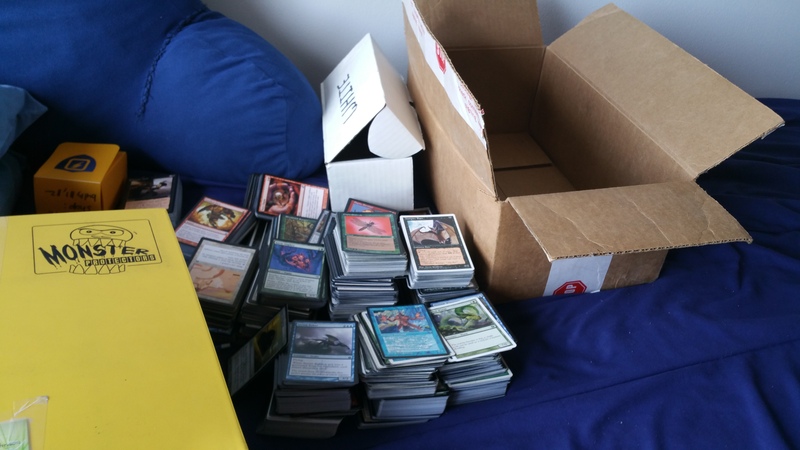 Thankfully I’m a college student and have other friends who had nothing to do but pick through my intimidating wall of Magic cards. That plus the promise of food and Netflix helps. Shadowborn Apostle has gone the way of Relentless Rats, to the surprise of zero people. 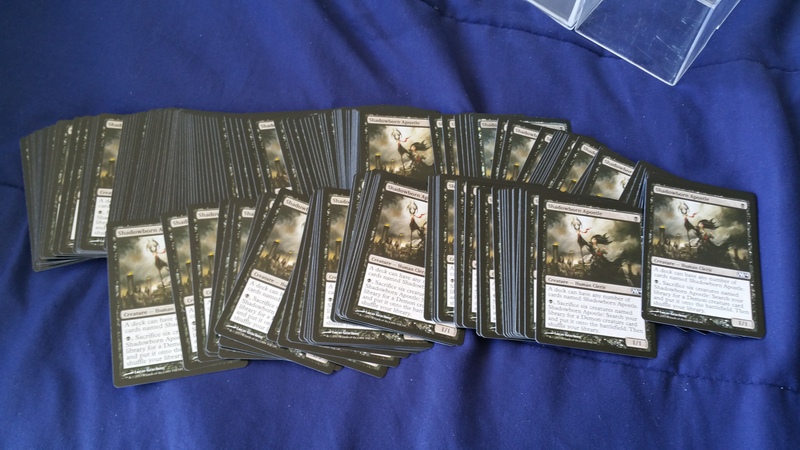 While buylists only pay around $.15, they’re easily able to be unloaded locally in sets of 20 for $15 to all of those casual demon players or anyone wanting to make a fun EDH deck with Athreos, God of Passage. Out of dozens of forgotten M14 commons, these guys helped make up for the fact that all of the relevant uncommons were already spoken for. As for the tokens, I’ve previously written about how tokens are often forgotten about and can be free money. While not all of them will be worth $.50 to $1 on a buylist, they’re easy ways to add a little bit of value to a trade here and there. At the absolute worst, I like to use them as throw-ins when I sell their associated card on TCGplayer, to practically guarantee a positive feedback review. As a general rule, a token will become more expensive as its associated card increases in price. If SCG will pay $.25 a piece for Young Pyromancer tokens, you can get at least $.50 to $1 from the actual players who want to use them. Eventually, I ran out of uncommons to ration appropriately throughout the 1K boxes. What I had left were 50,000 or so commons without additional uncommons, so I decided to label and price them differently without waiting to get my hands on more uncommons. 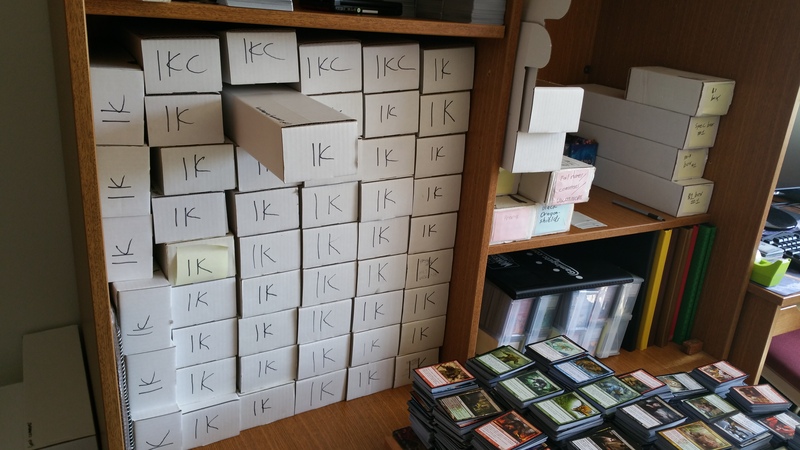 As you can see in the picture, the “1,000 commons and uncommons” boxes are labeled “1K”, and the ones that have zero uncommons are labeled “1KC”. You can’t see in this picture, but I have the labeling explained on the top of the boxes as well. I’ll be selling the ones with just commons for only $5 per thousand, and it’ll be a nice experiment to determine whether the casual players who shop at the store are more attracted to having uncommons in their boxes or the lower price tag associated with removing them. Thankfully, I have more than one out for these. In addition to having a passive source of income at the store, I’ll be making a Craigslist ad for these once I get back from Vegas now that I’m home for the summer. I’ve even seen a bit of interest on Facebook for buying lots of 5,000 cards for above my usual sell prices, which helps take shipping into account. The sentence, “I just want to have a bunch more cards to add to my collection, kind of like opening a much less expensive booster box,” is music to my ears, so I’ll be looking into Facebook in the future to not only sell singles, but bulk lots that have been customized to have rares and mythics included. I’ve seen multiple other articles where at the end of the exercise, the author will break down and calculate exactly how much money he made through buylisting the picked singles, selling the bulk, and determine an hourly rate that he basically worked for. I’m not going to do that. I already know that I probably made less than minimum wage during the time that I was randomizing these cards, boxing them up, moving them into the store, making advertisements to sell them, etc. However, I’m also a college student who didn’t have a whole lot else to do other than work on school papers, play League of Legends, and watch Netflix. I forgot to mention this last week, but thankfully I haven’t really seen anyone mention it since. While everyone else was complaining about the higher-end cards that weren’t in Modern Masters 2015, I saw that Spell Pierce had also been omitted. I don’t think that it has too high of a power level for Standard, so I wouldn’t be completely shocked to see it in something like Magic Origins or in the next Zendikar block. I think selling these off is the call for now. I had a local casual player ask me if I had any Archenemy schemes, and I was surprised to see that some of the random ones I had that were collecting dust were actually worth a decent amount of money. 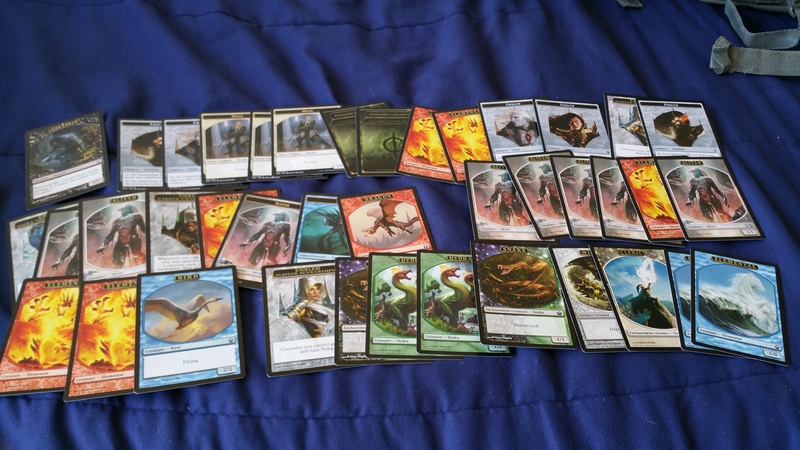 If you have schemes or Planechase planes from the multiplayer sets, I recommend doing an inventory and seeing if any are worth buylisting or throwing up on eBay/TCGplayer. Hint: the Time Walk one is worth something. 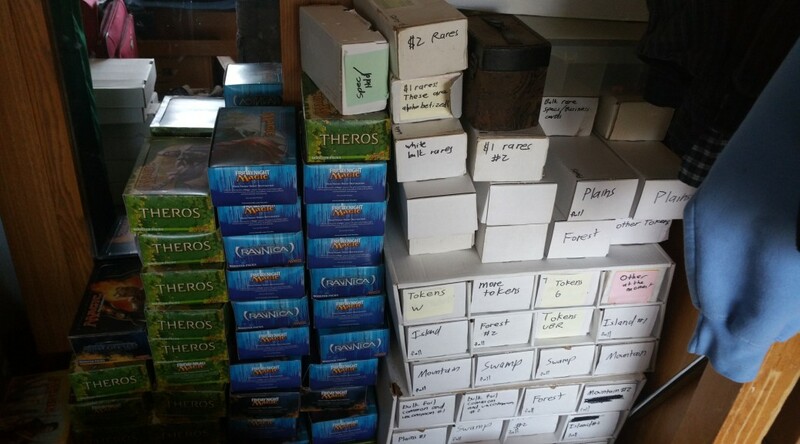 Anyone have personal stories of buying massive amounts of commons and uncommons? Find anything cool, or was it cleaned out like mine? Let me hear your stories! I’ll be in Las Vegas for the Grand Prix as of this past Tuesday, so hit me up on Twitter if you want to find time to hang out! One thing’s for sure. The texture of Modern Masters 2015 is very different from the original Modern Masters. Modern Masters was a highly synergistic Draft format (which led to an atrocious Sealed experience, by the way) with money up and down throughout the set. Of the original release, a full one-half of the rares were good pulls. It’s tough to nail down exactly how many you’d consider worth the pack, as we each have our own personal metric for that, but if we consider a rare to have been a good pull if it was worth roughly at least as much as the pack was, there are about 26 good rares. In a set of 53 rares, that’s damned impressive. 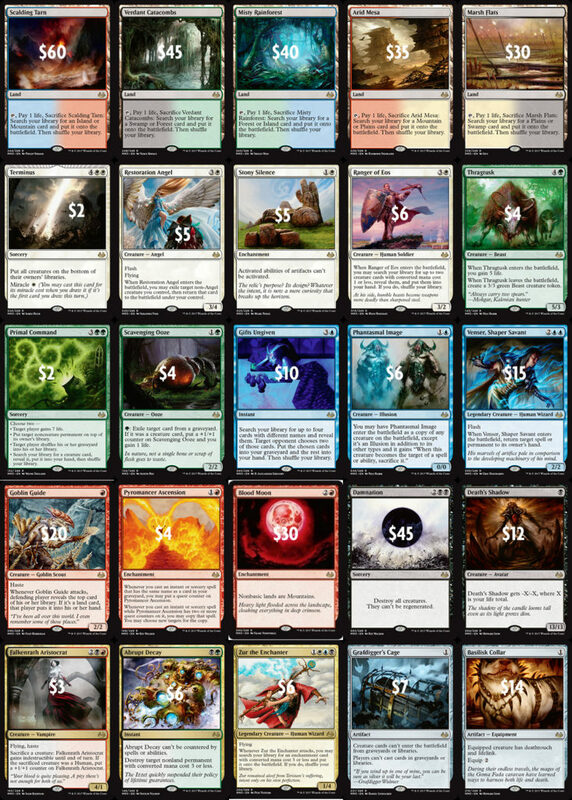 In contrast, Dragons of Tarkir, which also has 53 rares, only has about 10 good pulls. Mythics in the first Modern Masters weren’t bad either. Twelve of the 15 were at or above the curve, which meant that 80 percent of the times you opened a mythic, you were pleased with it, or about four of every five times. The commons and uncommons were quite rich, as well. There were 14 or 15 solid commons and uncommons, with all-stars like Path to Exile, Kitchen Finks, and Lightning Helix hanging around. Overall, there was a fairly robust distribution of value through a Modern Masters pack without even considering the foil slot. It’s not hard to see why packs regularly sold for over MSRP: there was a lot of cash jammed into each one, and simply finding them to purchase could be a challenge. What About the New Modern Masters? This time around, things are quite different. 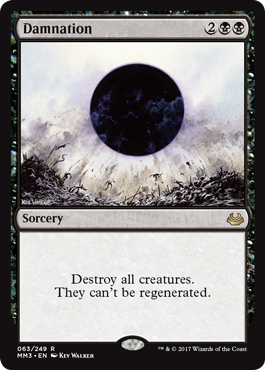 On the mythic side of things, Modern Masters 2015 hits a lot harder. Now a full 14 of the 15 mythics, 93 percent, are excellent pulls. Not only is all but one mythic a good pull, they’re good pulls. Ten of those 15 mythics clock in around $30 or more right now, with several in the $40 to $55 range. Compare that Kozilek, Butcher of Truth and Ulamog, the Infinite Gyre to Keiga, the Tide Star or Sarkhan Vol and you can see how much better the mythics are in Modern Masters 2015. When we move over to the rares, things swing hard the other way. Where MM13 had a full 26 solid rares, MM15 has maybe 13. Part of that is that the pack MSRP is a full $3 higher, which means cards in the $7 range don’t justify the cost of an MM15 pack in the same way that they used to justify a MM13 pack. The result here is that while half the rares you opened last time just about covered the cost at MSRP, this time only a quarter of them are going to. That puts us a lot closer to the Dragons of Tarkir ratio than the Modern Masters ratio. The commons and uncommons are weaker this time through, as well. Remand shows up, which is great for sure, but then after that, the goodies fall off quickly. Instead of multiple uncommons worth around $2.50 to $3, there’s only the one now. 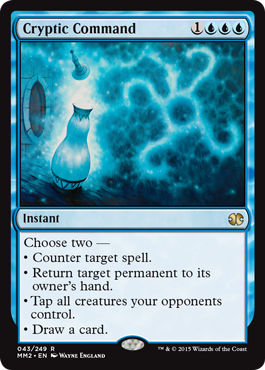 Electrolyze is back, which is fine, but it’s not covering half the value of the pack like it used to. Lightning Bolt is certainly no Kitchen Finks when comparing dollar signs. Eldrazi Temple is cool, but copies are already down below $3 and MM15 hasn’t even hit shelves yet. Let’s boil this all down for analysis. The mythics in Modern Masters 2015 are better than in the original run. There’s more of them we want to see, and they’re individually worth more money, as well. Only a quarter of the rares are valuable enough to cover the pack’s MSRP in MM2015, as opposed to half of them originally. 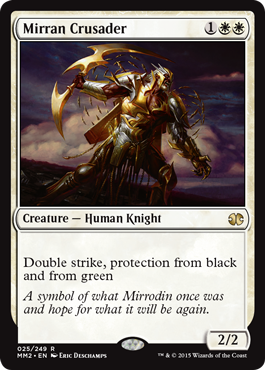 There’s some decent commons and uncommons in the new set, but overall not quite as many, and aside from Remand, they’re less strong individually as well. All of this leads us to a few conclusions. When the top end is top-endier and the dregs are unequivocal gutter trash, as we’re seeing now, prices are going to remain much more stratified than they were in Modern Masters, a far more egalitarian set. We can look back at a past discussion of box prices to understand how we arrive at this conclusion. The long and short of it is that a $240 MSRP box needs to be worth $240 somehow, and if people aren’t paying eight bucks for Comet Storms or six bucks for Mirran Crusaders now, they’re not going to start when more copies hit the market. 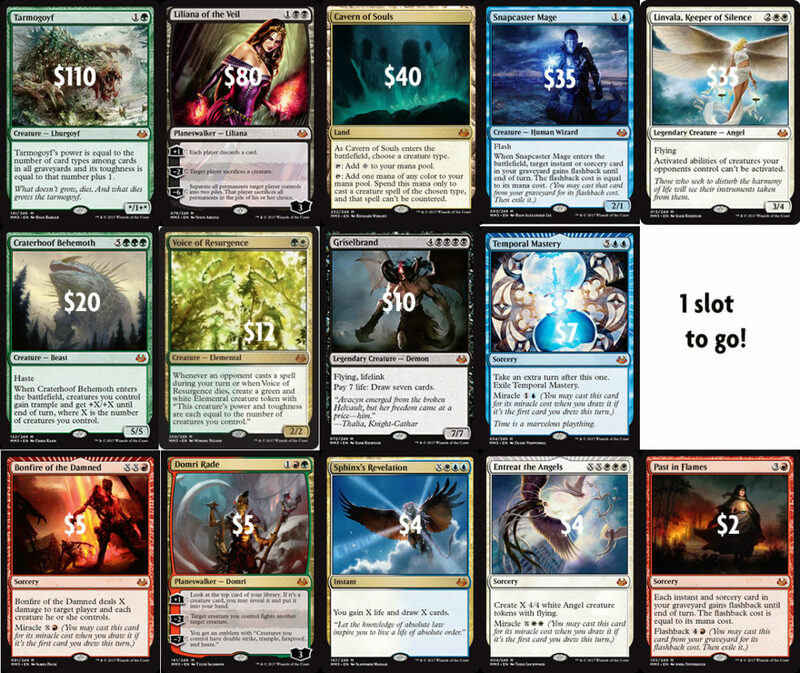 All of that value is going to exactly three places: good mythics, the absolute best rares, and some of the foils. This is in contrast to the first Modern Masters, where the $168 MSRP boxes had far more configurations to get you your money back. With so many valuable, in-demand uncommons and rares, and a less heavy top end, there wasn’t as much pressure on individual cards to carry the weight of the box. At a per-card level, we can make two predictions. Rares that aren’t currently worth much are going to be absolutely pummeled by the MM15 printing, while cream of the crop rares and nearly all mythics are going to see way less of a drop in price than some may have hoped. Gone, for example, are my expectations that Tarmogoyf may finally have his price cracked and end up south of $150 for an extended period. With the amount of work the mythics are going to have to do carrying this price tag, we really can’t expect that much of a loss in value. In fact, I’d venture that we see maybe a 10 to 20 percent loss of value on the mythics, and maybe not even that much on some of them. 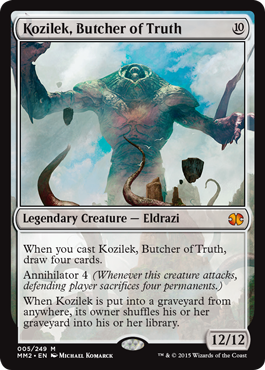 Kozilek has dropped from a fair trade price of $53 about a month or two ago to $46 today. I’m dubious that he’ll ever get below $40, and if he does, it won’t be by much, and it won’t be for long. I’m going to extend my predictions here beyond the immediate price drops as well. If the mythics have to work hard to support box prices, they’re not going to see a deep loss of price, and it’s not going to last too long, either. They won’t dip deep, and they won’t dip for long. When they begin to rebound, we could see them rebound quite hard—potentially above where they were before the reprint, perhaps within six months to a year. Why is that? Well, this was it. Modern Masters 2015 was the chance to make these cards more affordable and available. Prior to the release of MM15, there was this dark cloud hanging over the head of all of these cards. Even before the announcement, it was assumed that MM15 would happen and that cards like Fulminator Mage and Spellskite would be in it. Now that cards not in the set no longer have the immediate fear of a reprint over their heads, we may see prices surge. 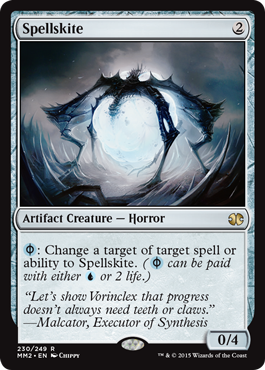 In three months time, we’re going to be saying, “They just reprinted Emrakul. They’re not going to print him again for at least a year or two.” That will be right about the time copies start hitting $70 and $80. Knowing all of this, it will be important to react quickly during the coming months. The good stuff won’t have far to fall, and when it gets there, it won’t be there for too long. Maximizing profits will require identifying when cards have stopped dropping and moving in within what will probably be a window of only a month or so. What cards, that I didn’t already talk about last week, should we be considering? Well, first of all, basically all of the mythics. 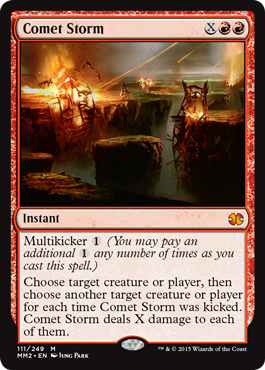 I don’t like Comet Storm at all, of course—stay the hell away. Primeval Titan isn’t exciting to me, either. This is its umpteenth printing, and without terribly strong demand backing it, I don’t expect it to rebound from all of this nearly as well as some of the other orange set symbols. Tezzeret the Seeker isn’t anything I want to be a part of, either. With zero competitive demand and only mild casual appeal, there’s nothing here that really excites me. Other than that, all the mythics are good. 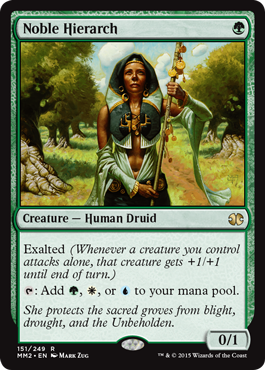 You’ll notice that prior to MM15, Elesh Norn was climbing. Despite everyone being aware of her potential inclusion in the summer’s Modern product, we saw her price climb from $30 last November to $40 in early April. This tells me that there’s real and powerful demand for her, which will support her price considerably as we get a few months past the MM15 street date. This demand, combined with Wizard’s hesitance to reprint iconic legends, has me looking to trade for copies when prices bottom out. I’ve never been able to keep an Elesh Norn in my binder longer than a few days. Despite lukewarm Modern performance, Bitterblossom has sustained a surprising price tag. Tokens has evergreen appeal, even in competitive formats, it seems. With the Modern event deck last year being BW Tokens, there’s probably quite a few people out there looking to start or finish their sets of Blossoms. As for the big colorless three, Battle for Zendikar is going to bring us additional enablers for Eldrazi, which will only make them more playable in more formats. 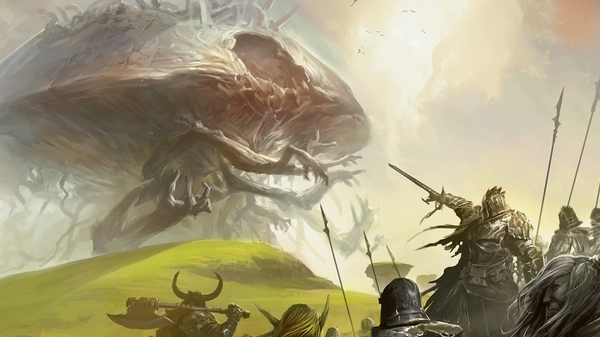 It’s not unreasonable to imagine that BFZ may bring us just enough to push multiple Eldrazi into a competitive Modern deck, which would be a tremendous boon for their price tags. Imagine some sort of deck that runs eight to 12 big, honkin’ Eldrazi, Temples, Urzas, and a few Eyes to hurry them out, Sylvan Scrying and Maps to find lands…could it be real? I don’t know. Depends on what we get. I’m just daydreaming now. Let’s move on. Dark Confidant may not fare all that well once the dust settles. While he’s currently one of the better mythics to open, his price is supported fully by the competitive scene—a scene which has been sorely lacking any Confidants for some time now. Neither in Legacy or Modern have we seen much confidanting, really. Even though MM15 is poised to do a great job supporting the prices of its mythics, that relies on the assumption that those mythics are still desirable to their respective crowds. I’m probably staying away here, actually. Kiki-Jiki, Mirror Breaker won’t drop dramatically, but his will be one of the slower ascents. Like Dark Confidant, he just isn’t making the rounds quite as much as he used to, which means we’re combining a reprint with an overall loss of demand. He’s still an extremely powerful card though, both at the kitchen table and the feature-match table. If a Modern deck pops up that needs Kiki-Jiki rather than Splinter Twin again, he’ll move fast. How about the rares? What looks exciting to us? I didn’t intend to choose these such that they represented all five colors and an artifact, but here we are. That’s balance for you. These are the rares that are best situated to rebound after the set hits its price floor. Each enjoys a strong competitive demand profile, which bodes well for rapid recuperation of price. A lot of people are still missing their own copies of these, especially Cryptic Command, Leyline of Sancity, and Fulminator Mage. A year or two ago, I had given up on owning Fulminators until they were reprinted. 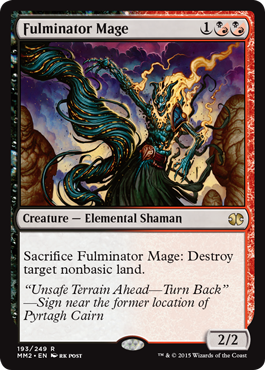 I have been completely removed from the market for Fulminator Mages. If you counted all the people worldwide that needed Fulminators, I wouldn’t have been included. Now that they’ve got their second printing, this is the cheapest they’ll be for a long while, basically until they completely fall out of the format or they get reprinted again (and again.) Because of that, I’m now coming into the market looking for a set. I’m an example of how a card that has been reprinted can see its price rise rather than fall, because total demand can increase faster than the number of copies on the market. All of these cards are capable of that behavior. Anyone that plays Modern regularly will be looking for their own copies, and many personal playset binders are missing these. I’d expect each of these to possibly double from their floor within a year, depending on how far they end up actually falling. 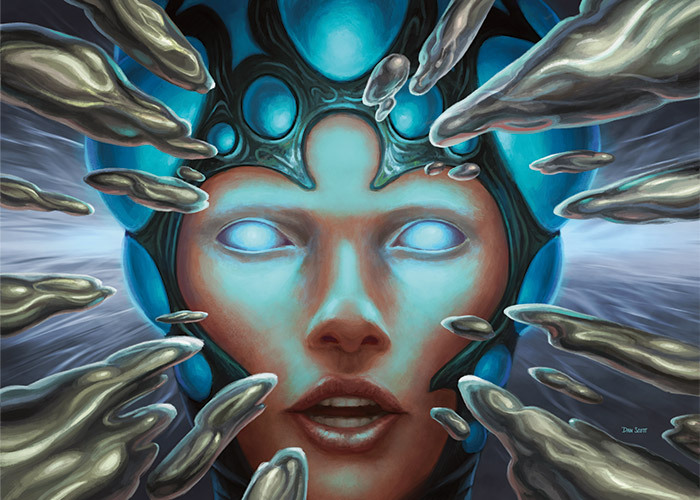 Serum Visions has been confirmed for the August FNM promo (with Path to Exile coming one month before it.) The increased supply isn’t going to be enough to lower prices, especially with art that cool, because even those that already own sets of Visions may want this promo (like me.) I’m thinking Wizards got caught with their pants down on this one and didn’t expect Visions to be $10 ahead of Modern Masters 2015, and now there’s no way to get more copies into the system for at least six or nine months. I’d expect an overall increase in price on Visions, possibly north of $15. I wouldn’t want to be holding copies past the end of the year, though. Completed listings for Tarmogoyf are in the $140 range. This strikes me as a reactionary or fire-sale price. It may slip lower yet, probably about two weeks to a month after the GPs when supply is extremely high, but I don’t believe its price will remain that low. It’s too good in too many formats, too iconic, and these packs are too expensive for it to suddenly lose $40 to $60 in value.